How effective are reflectors as a safety tool? Any self-respecting cyclist will tell you that reflectors are their first line of defence against the creatures that lurk in the dark (Read: Motorists). But to know the extent of its usefulness, it’s important to know how reflectors work. Retro-reflectors are a visual equivalent of ‘Right back at you!’. 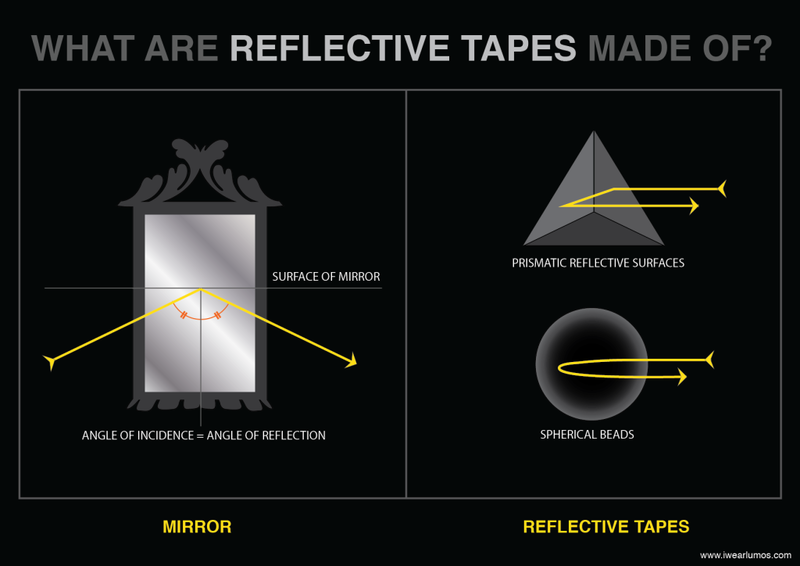 Reflective tapes and stickers have an array of mirror-like surfaces. However, unlike mirror-flat surfaces, these tapes have a repetitive-structure of spherical or prism-like walls. This helps to manipulate light rays that glance upon you (The Flashee), back in the direction of the source (The Flasher). The sharper the ray of incident light, the sharper the reflection. So, diffused and scattered light (a neon sign or general light-pollution haze) falling upon a reflector may cause a faint glow, but nothing significant enough to light up your spandex-coated self. 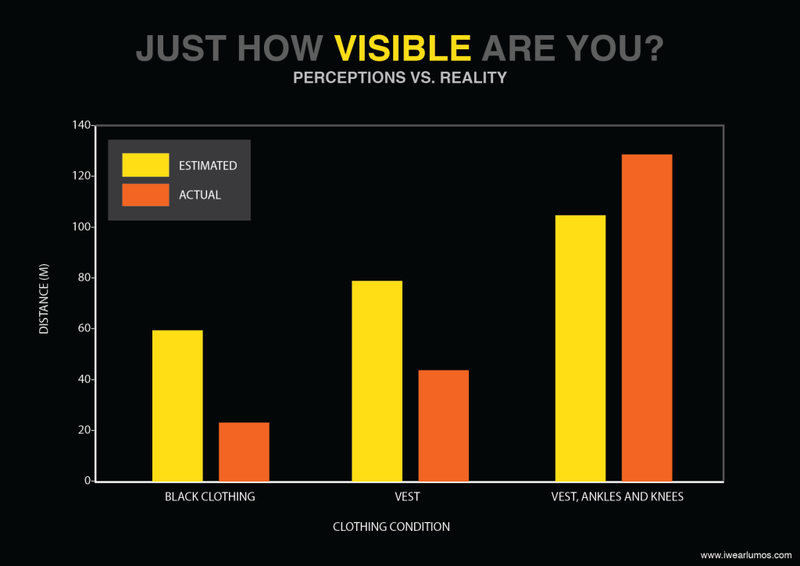 So, just how visible are you anyway? Blunt answer: Not as visible as you think. According a study by Joanne Wood of the Queensland University of Technology in Australia, riders tend to overestimate the effectiveness of a reflective vest by almost 2X the visibility it provides. So, what makes Reflectors less effective than is thought to be? Reflectors cast no light of their own and merely reflect car-headlights. 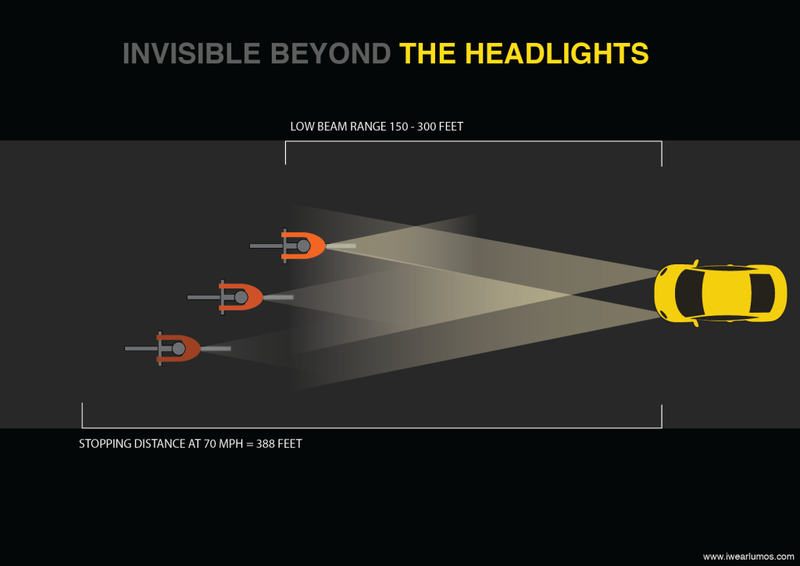 Most low-beam headlights will allow motorists to spot an object on the road between 160 – 300 feet (50-100 meters) ahead of their vehicle. 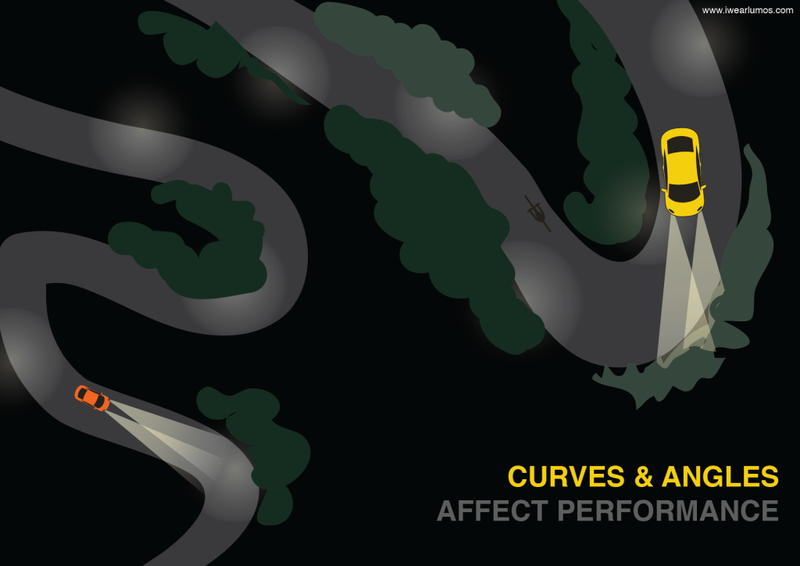 A car travelling at 70mph (the American average) has a stopping distance of 388 ft! Hence and thus, the math proves alarmingly, that if you rely on reflectors alone, cars moving at anything above 50mph, will pose a serious threat to you. Weather conditions have a disproportionately higher impact on reflector’s abilities. 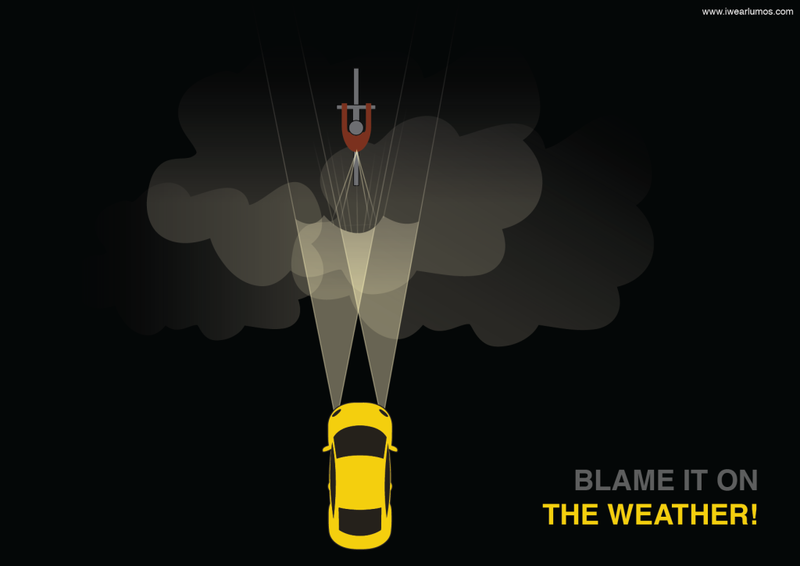 The same weather conditions that are most dangerous to drive or cycle in, render the reflectors almost useless. Foggy conditions and rain cause headlight beams to diffuse and scatter. This can reduce its effectiveness to almost one-third of its performance. The headlights may not shine directly on the reflectors – both because the car may not be at a perpendicular angle to the reflector and because car headlights are designed to be pointed down toward the road. This means that you are still vulnerable while taking turns and changing lanes. So when are Reflectors effective? Reflectors are most effective for short-range visibility. A TNO report shows that reflectors are as visible as rear-lights at a distance of 15M, but beyond 100M, reflectors stop being visible at all together. Size, color and shape of reflective area matters. Reflective vests help motorists get perceive the width of the rider. Most such vests have a reflective stripe stitched onto a hi-vis color. If you have the choice of colours, pick white- it’s the most visible of the colours. Additionally, curved reflectors improve the Observation angle and hence, the effectiveness of reflectors. Consider a tape that wraps around the saddle post, or reflective ankle-cuffs. We already know that blinking lights attract more attention than static lights. Similarly, moving reflectors attached on pedals, spokes, and pant cuffs can increase your ‘noticeability’ by upto 1.8 times (according to a study conducted at Queensland University of Technology, Australia). 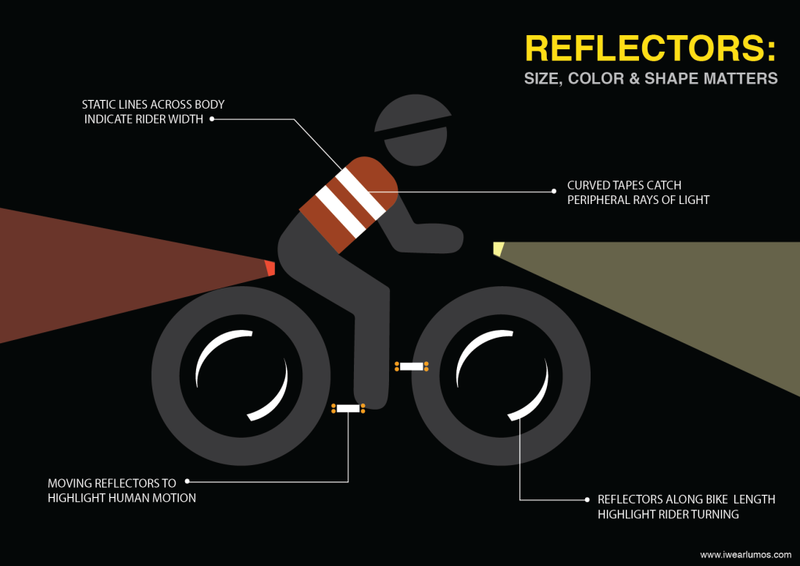 Reflectors are effective and a worthy ADDITION to bike lights. And if those bike-lights have died on your way home, they’re definitely better than nothing at all!